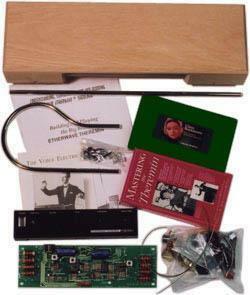 The Etherwave Theremin, designed by Bob Moog, is the most popular theremin kit ever produced! Build your own Etherwave from this easy-to-assemble kit. No previous electronics knowledge required, but you will have to do some soldering. The main board is assembled and tuned at the factory. Features nickle-plated antennas, birch plywood cabinet, and external power supply. Also includes the "Mastering the Theremin" video featuring Lydia Kavina, and Clara Rockmore's "The Art of the Theremin" on CD.